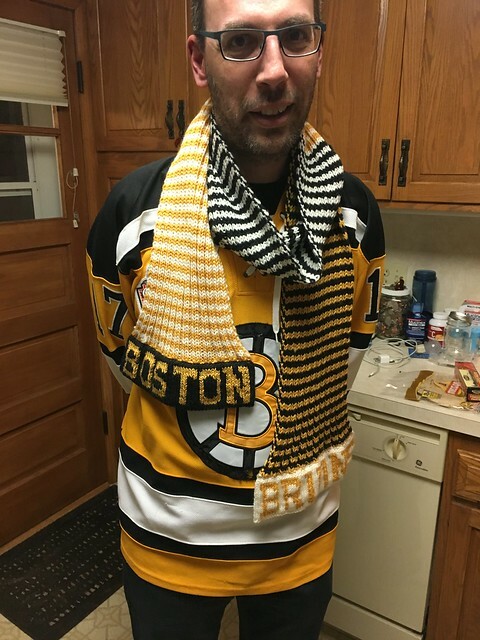 Completed: November 12, 2016 – just in time to see the Bruins at Wild in St. Paul a week later! 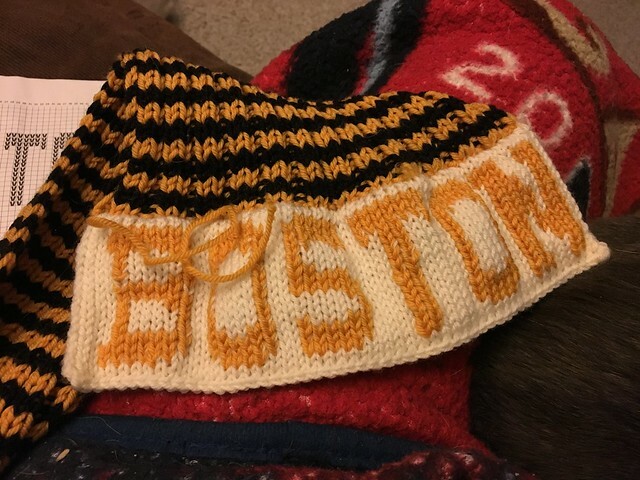 This is a sibling project to the Bruins beanie that I had knit for Jason during the 2014/2015 winter. 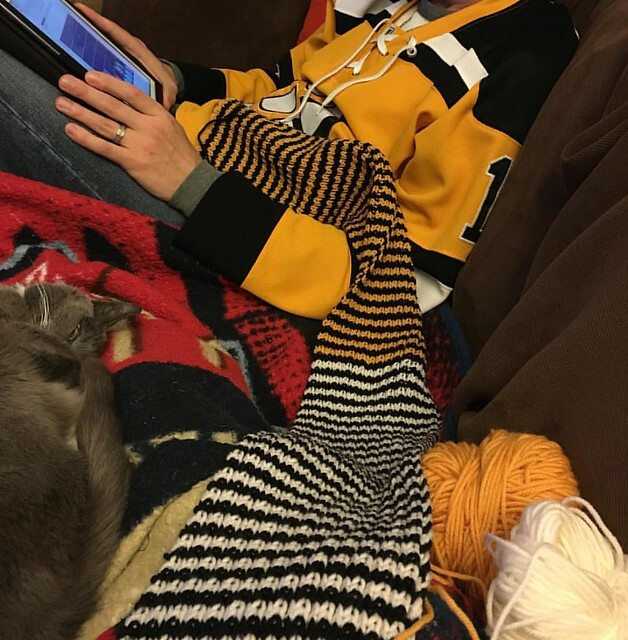 I started it in October 2015, intending for it to be a quick project that I could sneakily work on during a business trip I was making and subsequent knitting group nights, but surprisingly (read: not surprisingly) my attention waned from the monotonous ribbing pattern. Not even the stripes could keep me interested! So, this took a while to complete just like the rest of my projects. However I only revealed it’s existence to Jason when it was very close to completion — not including the custom lettering I added as a finishing touch. I was inspired by a scarf I once bought from a vacation in Canada; the body was single-layer and the ends were knit in the round with lettering, so the stranding was nicely hidden. I’m happy with the final product, but if I were going to redo it I know that I picked up too many stitches to match the width of the ribbing — it fans out too much. If it were more narrow, though, I might’ve only had room for the Bruins’ “B,” which wouldn’t have been bad but not ideal. I had never done duplicate stitch before, and I’m not sure I’ll ever do it again. I had just enough yarn to accomplish it for this project, though, so it worked out. (The photo above shows exactly how much yarn I had left in the end – mere inches!) I did chart out “BOSTON” and “BRUINS” using their logo’s typeface for inspiration. Since this was supposed to be a surprise gift, I don’t have many in-process photos but it’s not really that exciting of a knit. I do like the texture and squishy-ness that the ribbing created, but I’m not wild about Cascade 220 Superwash. The fibers split pretty easily and felt somewhat coarse on my hands as I worked with it.